Click here to see his video on youtube about Chi kung performing and Wudang sword. My name is Ariel Pablos and I have been a student at Kunyu mountain Shaolin Martial Arts Academy since August 2013, almost 2 years now. Going to Kunyushan was the best decision I’ve ever made in my life. I originally planned on being there 6 months but within a month I knew I needed more. The masters are breathtaking, the students are diverse and interesting (it takes a certain breed to travel out to China to train Kung Fu), the mountains are majestic, and the training is not just exercise- it’s a lifestyle. Pablo broke the hard slate by one hand through hard chikung. Life in the mountain is wonderful. You get to fully experience all 4 seasons- a key to martial arts training. The working staff are all really friendly and helpful. I personally love the food- 3 meals a day with weekly rotating menus. There’s a small shop with all the snacks one could need (with a new soft cone ice-cream machine which is my new addiction). We are just at the base of a natural preservation district so we are nestled in a mountain valley with bamboo forests and apple and cherry farms all around. It makes for a beautiful morning run. With an open mind, Kunyu academy has so many gifts to give. I originally came to learn Taiji and Qigong, but upon being placed under master Guo I started to train Wing Chun, Baji fist, and Sanda as well. Learning different styles at once was actually one of the best surprises that I ever got because it led me to experience so many different aspects of martial arts at once, causing my growth to be much more well rounded; stillness in Qigong, soft power and grace with Taiji, speed and elegance in Wing Chun, explosive power with Baji, aggression with Sanda, and so much more that I am not writing down. When I arrived, I couldn’t do 20 pushups or kick higher than my waist. Now, I can do hundreds of pushups on command, break marble, do full splits, and kick even higher than my head. I didn’t even have the coordination to do basic line drills, things like moving my feet and my hands at the same time. Now, I can imitate most motions simply by watching, even when it’s another group doing moves I’ve never tried before. My progression in fighting has been everything I would’ve hoped for. I remember I could only throw hooks and haymakers when I arrived- no kicks no straight punches and certainly no combos. Now I’ve ended fights in my first punch, and several fights in under a minute, with takedowns and strikes. The biggest gift I’ve found here is Qi. I never knew energy was a real thing before coming to Kunyushan. I thought it was all just a metaphor or a mental thing. But to physically feel your qi is like gaining a new sense. It is priceless. 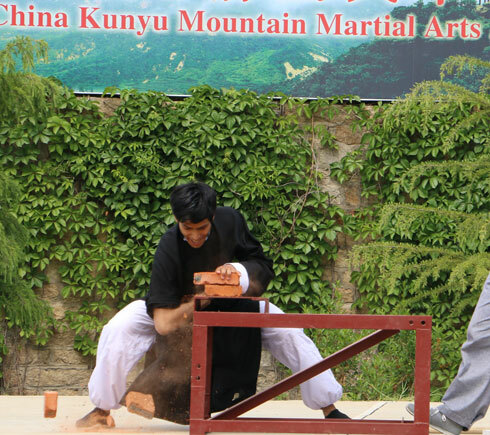 With time, Kunyushan offers all the gains one could hope to gain from martial arts training. There are two main rules that I’ve found that one needs to follow to reap these benefits: never give up and always try your best. I know that sounds corny, but you realize how difficult it is to always do those things once you’re training 6 hours every day. I believe that anyone can become an amazing martial artist under the guidance of the Kunyushan Masters no matter what background or level of experience they come from. This place can make dreams come true and lead one to believe in the magic of life.